The pound sterling (GBP; £ or ₤), also called just the pound, is the official currency used in the United Kingdom. It is also used in British overseas territories, Isle of Man, Bailiwicks of Guernsey and Jersey. The pound is divided into 100 pence. Today's coins are 1 penny, 2 pence, 5 pence, 10 pence, 20 pence, 50 pence, £1 and £2. The notes are £5, £10, £20 and £50. As of January 2018, one pound was equal to 1.39 United States dollars. A pound coin originally weighed one troy pound of sterling silver, giving the currency the name "pound sterling". "Sterling silver" means mixed metal that has 92.5% or more real silver. One pound sterling was originally divided by 240 sterling pence. This was because there are 240 pennyweights in a troy pound. So a single one–pound coin weighed one troy pound and a single 1–penny coin weighed one pennyweight. The Latin word for "pound" is libra. The £ or ₤ is a stylised writing of the letter L, a short way of writing libra. This is similar to how a pound of mass is abbreviated "lb". Up until around the 1970s, especially on typewriters or keyboards without a "£" symbol, it was common to write "L" instead of "£". The symbol for pennies is p. The British write 50p or £0.50 and say it "fifty pence" or simply "fifty pee"
The pound has only been divided into 100 pence since 1971. Before this time it was divided into 20 shillings. Each shilling was divided into 12 pennies. The symbols for shilling and penny came from Roman coins: "s" for shilling (from the Latin word solidus) and "d" for penny (from the Latin denarius). The penny was divided into 4 farthings. 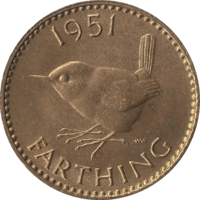 The farthing became obsolete (was no longer used) in 1961 because it was worth so little. Coins just before the change in 1971 were: 1/2d (ha'penny), 1d (one penny), 3d (threepence; the coin was called a "thrup'ny bit"); 6d (sixpence); 1s (one shilling, also called one "bob"); 2s (a florin); 2s6d (half a crown; the crown, 5s (a quarter of a pound sterling), was not used in modern times). 2d (two old pennies) was always pronounced "tuppence"
One shilling was written "1/–" (sometimes called a "bob"). Prices in shillings and pence were pronounced like this: 2/6 (or: 2s6d) "two and six" (or: "two shillings and sixpence"). The price £4 6s 3¾d was pronounced: "four pounds six shillings and thruppence three-farthings"
There was also a guinea. Originally the guinea was a gold coin. Although the coin had not been minted or circulated for a long time, prices were still sometimes given in guineas. A guinea was 21s (or £1 1s 0d). A price of 58 guineas was, in fact, £60 18s 0d, which sounds more than "58 guineas". In circulation before 1971 were the halfpenny, penny, threepence, sixpence, shilling, florin, crown, sovereign, ten shilling note, and the one, five, 10, 20 and 50 pound notes. The crown and sovereign were legal currency before 1971. By then they were commemorative coins and not commonly found in circulation. They are both still legal currency at a value of 25 pence and £1 respectively. In 1971, the pound sterling of the United Kingdom and the Irish Pound of Ireland were decimalised (divided into 100). Most coins were de-monetised. £1 was equal to 100 pence after then. One shilling became 5 pence, remaining ​1⁄20 of £1. £1 stayed the same. This page was last changed on 22 March 2019, at 19:52.